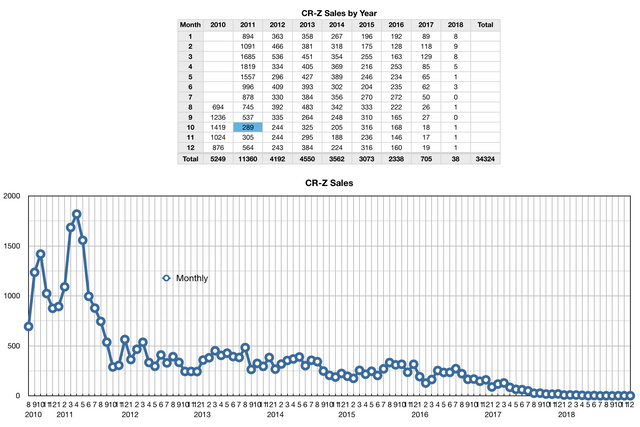 Interesting how flat the sales were after Oct of 2011. What happened? Yeah, and total lifetime sales never matched any single-year sales of the CRX, except its final year. 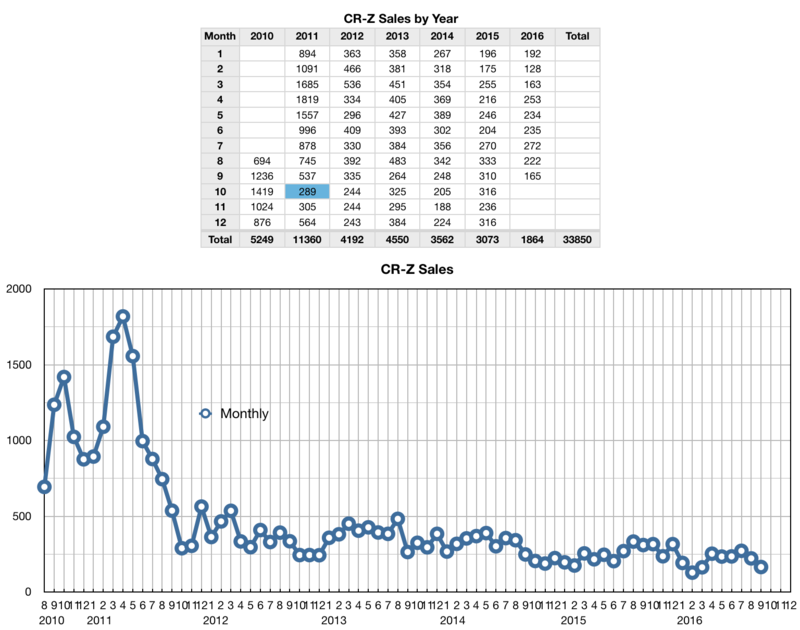 Was there a 2011 model year recall that caused the sales to tank? .....or, did gas prices drop at that time? Did that coincide with the earthquake in Japan that shut down half the country? I'd wager marketing vs. no marketing. I remember being excited about the CR-Z ahead of its release. Marketing disappeared afterwards. Honda aren't dummies, and I assume they decided against investing the $ into marketing the vehicle due to a lackluster first year performance and low/no anticipated returns from marketing. It's a shame really. I'd love to see a 2nd generation CR-Z with similar styling and that 1.5 Turbo, and a decorative back seat. I think you are at least partially right. The earthquake happened in March 2011, which coincides with the dramatic drop in sales. There was another big aftershock in April. A local dealer told me that summer that they could not get any more Zs for a while because production had been halted due to unavailability of parts. There was no mention of the factory being damaged, but parts suppliers for the Z were unable to meet delivery schedules. Maybe this, in combination with lack of promotion by Honda after normal production resumed, was the cause. Probably also didn't help that dealerships were(and many still are) very reluctant to make price concessions due to the lack of production. Quaestor Black, Defiant, CuteZ and 2 others like this.